Founded in 2013, the Fraser Valley Bus Cooperative (FVBC) was formed by three seniors-serving agencies in Langley, BC. These co-operative agencies recognized a need in their community and set out to do something about it. Social and physical isolation is a serious issue for many people, including senior citizens and disabled persons. 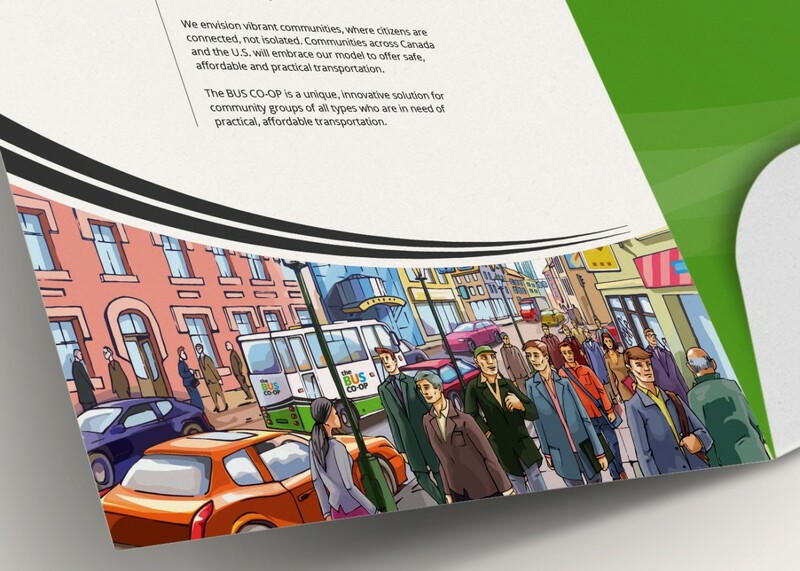 The vision of this organization was to build a transportation model to resolve isolation, connect communities and be replicated in any city. FVBC; a social enterprise startup, came to us with the overarching challenge of finding a way to introduce this inspirational transportation model. This was a new concept in North America and they wanted to introduce it in a way that was simple to understand. The legal name posed an initial barrier, it was long, the acronym (FVBC) wasn’t memorable, and it was too closely tied to one region. The development of vibrant logo and visual identity and resonant marketing and communications materials that would start conversations and motivate people to use the service. As a newly formed organization funded solely through grants, they needed a flexible approach that could maximize the budget available. Facilitating a series of discovery sessions with the founding members provided the insights into their shared beliefs of what this organization could be and the value it would provide for any community. We were able to weave their combined perspectives into inspiring messaging for the co-op. During the discovery we uncovered that the team was unsure of how to define their target audiences, having no previous marketing experience. They welcomed an opportunity to have us coach them on how to determine and define target audiences. This resulted in uncovering some ‘blindspots’ and creating two group profiles they hadn’t considered who would help their organization grow and thrive. 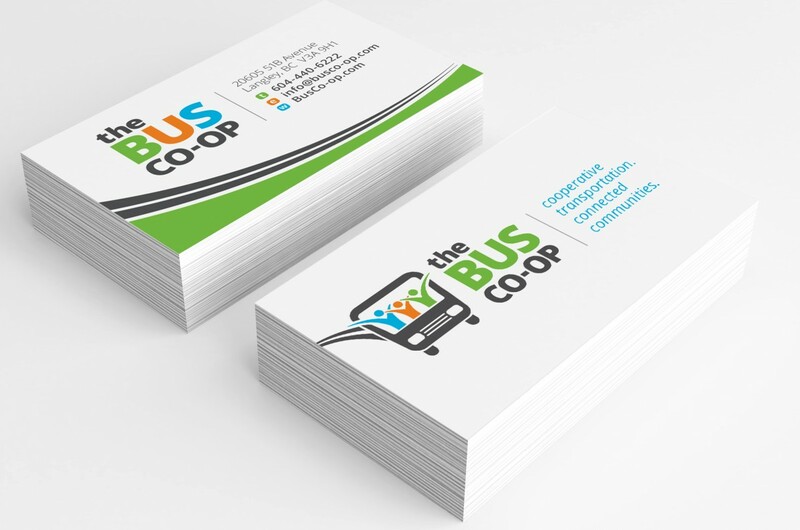 During the facilitation sessions everyone began referring to the co-op as ‘bus co-op’. We brought our observation of this natural baptism to the three stakeholders and thus “The Bus Co-op” was born. The design and development of their visual identity was fun for us all, as the team wanted to create an approachable, vibrant and fun identity. One that people couldn’t help but notice and smile when they saw it. 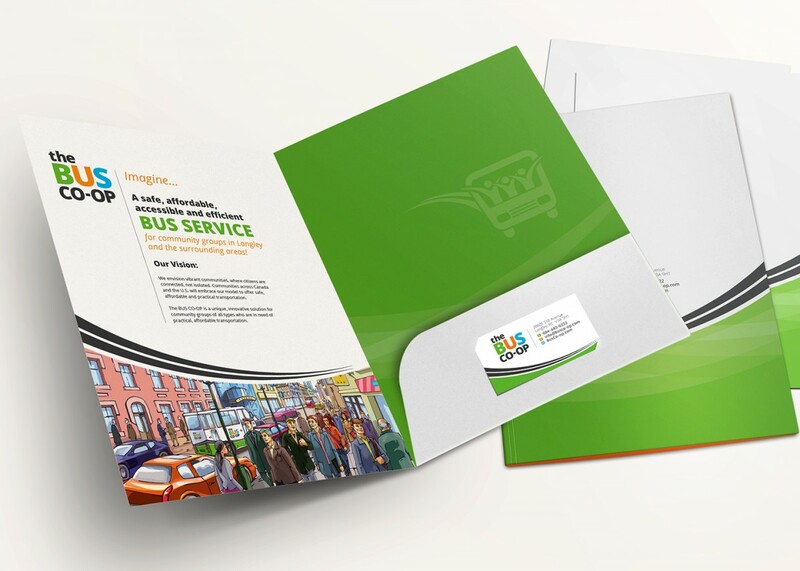 We set out to design an identity with bright colours, a logo that was fun and inviting and when their buses were wrapped in this new identity The Bus Co-op definitely got noticed and stood out from city transportation. 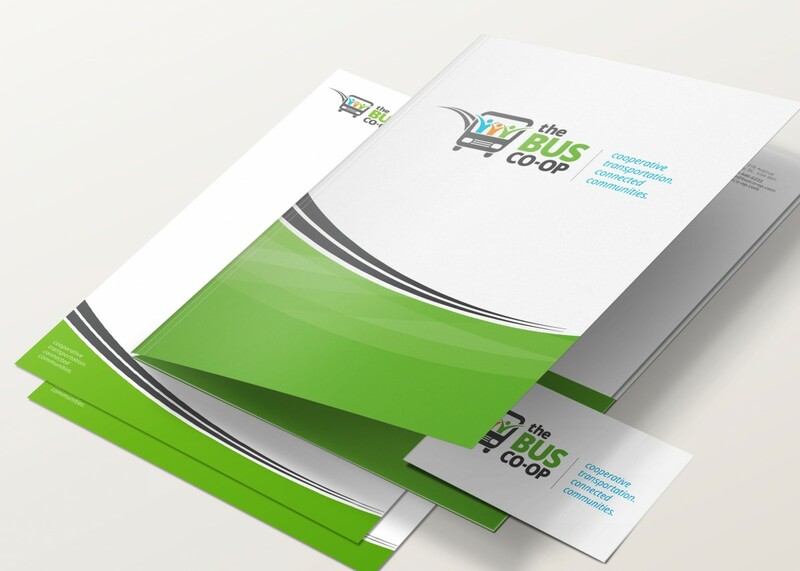 Since the launch in October 2014, The Bus Co-op has continued to create a buzz and develop partnerships in the community. By having professional marketing tools with clear messaging, it provided confidence for the founding members to approach organizations and establish new partnerships. The Bus Co-op, along with their administrative partner Better Environmentally Sound Transportation (BEST), have attracted media attention and been interviewed on Co-op Radio. 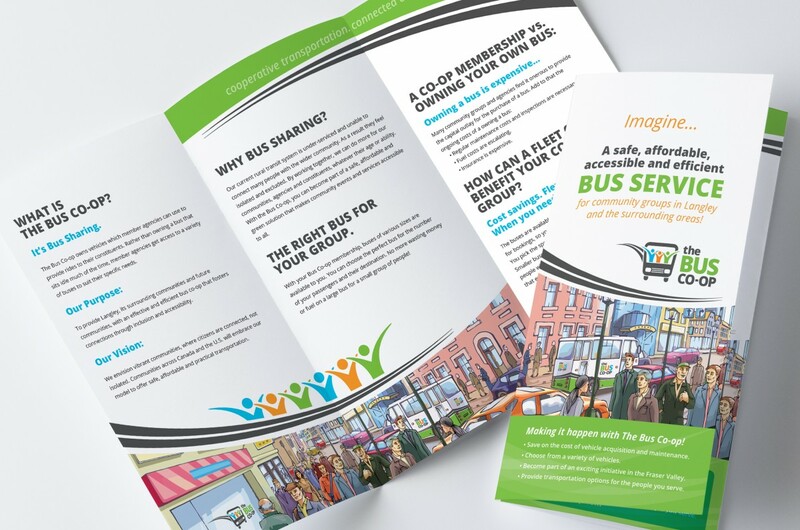 With the an easily recognizable name and logo, not to mention the bright colours, their buses get noticed and assist in creating a buzz that leads to new conversations with groups interested in either joining as members or utilizing the service. A significant outcome is a partnership with Envison Financial, where the credit union has partnered with The Bus Co-op to provide regularly scheduled transportation for seniors in their community. The services provide transportation for the seniors into the town to do their banking, groceries and errands plus it offers them the opportunity to meet new people and socialize while on the bus. 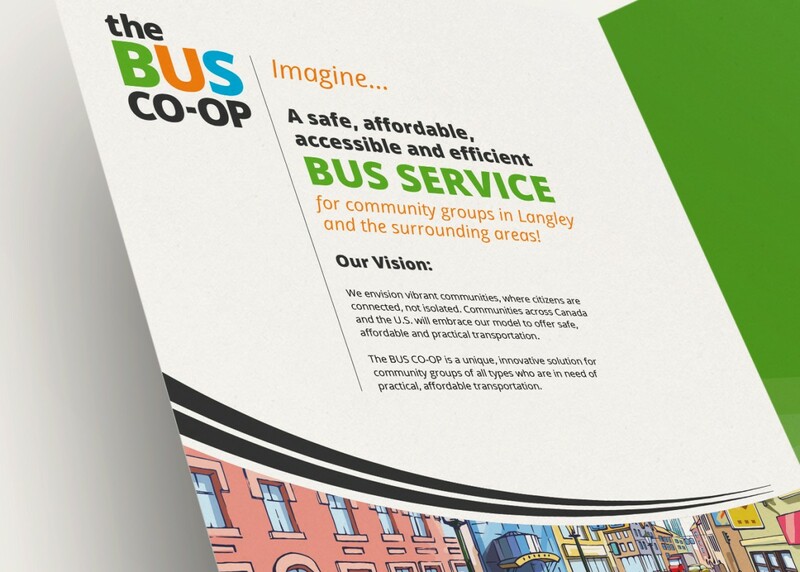 A big first step towards achieving the Bus Co-op’s vision of resolving isolation and connecting communities. Big Bold Brand met us where we were at and made it a fun, collaborative process! They do what they say they are going to do and stick to the time-line. Bringing expertise and a unique approach to the branding process, Karley and Elise engaged our diverse stakeholder team in deeper conversations and got us to explore perspectives we hadn’t even considered – driving great results for The Bus Co-op. Distilling complicated concepts down to clear and compelling messaging and visuals is definitely a strength of theirs.